FISA Memo, The FBI And The Missing Texts: Get Caught Up On The War Over The FBI Republicans are waging a multifront campaign against the FBI and the Justice Department over what they call bias. Democrats call the whole thing a smoke screen. Republicans have lots to say publicly about a secret memo by Rep. Devin Nunes, R-Calif., that they say exposes abuse of power by the Obama administration. The specifics aren't clear because it is classified and available only to members of Congress. What is clear is that Nunes' colleagues who have read the memo say it must be public. But the process by which Congress could release a document involving classified information from the executive branch is fraught — and Nunes has so far not taken the step of sharing it with the FBI. But the secrecy has not stopped Republicans from sounding an alarm about what they say is a scandal of epic proportions: a huge alleged abuse of surveillance power by the previous administration. Democrats, meanwhile, dismiss the memo as a new partisan attack on the FBI. They say it's part of a broader GOP campaign to undermine the bureau and, by extension, special counsel Robert Mueller's investigation into possible coordination between the Trump campaign and Russia. Here is a quick explanation of the memo and other developments in the churning politics surrounding the Russia probe. 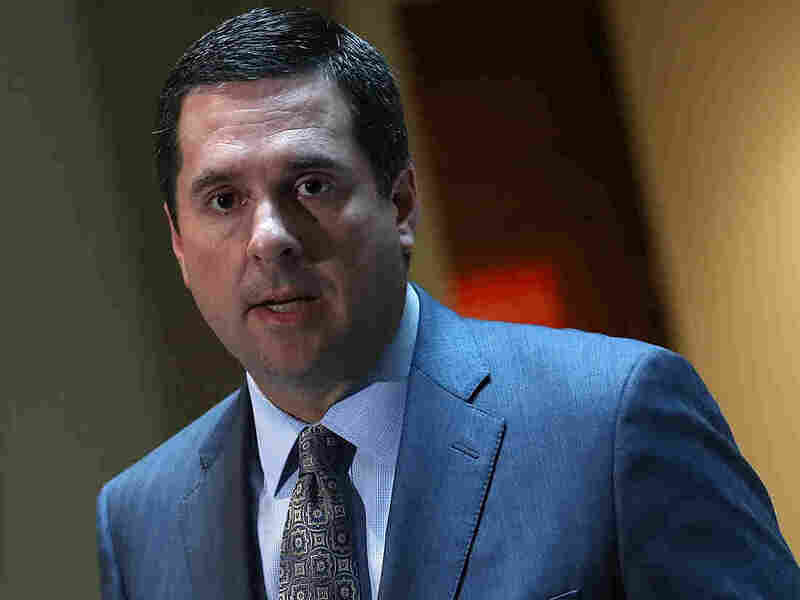 As the House Intelligence Committee sputtered into partisan mudslinging over the Russian interference in the 2016 election, Nunes has conducted a parallel probe of his own into what he alleges was the Obama administration's abuse of the surveillance authority known as FISA. The memo is the outcome of Nunes' efforts. Some 200 House Republicans have made a trip to a secure facility in the Capitol to read the document. Many have then taken to Twitter or cable news shows to warn of what they say are gross violations by the FBI. Rep. Steve King, R-Iowa, described the memo's conclusions as "worse than Watergate," while Rep. Jim Jordan, R-Ohio, said the document "is so alarming the American people have to see this." The baseline allegation appears to be that the Obama administration used surveillance tools to target the Trump campaign and that the Russia probe is at root a politically motivated investigation. It's about "the activities of the last administration, the crimes that, I believe, were committed and the total sham that this Mueller investigation is built on a false premise and rotten to the core," said Rep. Matt Gaetz, R-Fla.
Gaetz, the freshman from Florida's 1st District, has been out front in building the public case against Mueller, threading together the 2010 sale of a uranium mining company to the Clinton Foundation and the need for the Justice Department to appoint another special counsel. As for Nunes' memo, it's unclear whether it will ever see the light of day. Republicans say they are searching for a way to declassify the document so it can be released to the public. The standard declassification process would involve sharing the document with the government agencies that own the classified information contained in the memo. Those agencies would review the material before its release. So far, at least, the FBI says it has not been allowed to see the document. "The FBI has requested to receive a copy of the memo in order to evaluate the information and take appropriate steps," said FBI spokesman Andrew Ames. "To date, the request has been declined." A Nunes spokesman did not respond to a question about whether the committee had requested an FBI classification review of the document. Under House rules, the intelligence committee can vote to disclose information that it determines is in the public interest. If the vote passes, it would kick the matter to the executive branch for a review. The president can authorize or reject the material's release. The full House could vote to override a presidential objection. White House press secretary Sarah Huckabee Sanders told reporters on Tuesday that President Trump might have to be involved with the declassification if the process reaches that point. But there is no requirement in law or other forcing function that would mandate the memo be released. And Republicans could calculate that their political hand is stronger if they can discuss the cards they're holding without revealing them. House Democrats have dismissed the memo and its conclusions as a hit job with the aim of discrediting the Russia investigation. Moreover, they argue, Russian-linked social media accounts have picked up the cause as part of the ongoing campaign of what intelligence officers call "active measures" aimed at the United States. Fake online accounts began amplifying controversy and divisions among Americans since 2016 and have never stopped. House Intelligence Committee ranking Democrat Rep. Adam Schiff and Senate Judiciary Committee ranking Democrat Sen. Dianne Feinstein, both of California, called on Facebook and Twitter to investigate the accounts. "If these reports are accurate, we are witnessing an ongoing attack by the Russian government through Kremlin-linked social media actors directly acting to intervene and influence our democratic process," they wrote. "This should be disconcerting to all Americans, but especially your companies as, once again, it appears the vast majority of their efforts are concentrated on your platforms." Separately, the nine Democrats on the House Intelligence Committee called the memo a "misleading set of talking points attacking the FBI." They said Republicans want to release it for the "political purpose of spreading a false narrative and undermining legitimate investigations." Rep. Jerrold Nadler, D-N.Y., the ranking member of the House Judiciary Committee, joined in with a condemnation of his own. "The Judiciary Committee can no longer be silent while President Trump and his allies attempt to protect themselves by smearing career officials with lies and innuendo," he said. By Wednesday afternoon, Schiff said Democrats were preparing their own classified memo that rebutted the Republicans' memo, one that also would be available to all the members of the House. Current and former FBI officials complain the nonstop political battles in Washington are taking a toll on the bureau's reputation and could hurt the work of special agents doing their jobs in the field. The Nunes memo is not the only chum in the political waters. Republicans also have seized on anti-Trump text messages between senior FBI agent Peter Strzok and FBI lawyer Lisa Page to support their allegations of political bias within the bureau. Strzok worked on the Hillary Clinton email investigation and the Russia probe, although Mueller removed him after the text messages came to light. The Justice Department provided lawmakers on Capitol Hill with an initial tranche of nearly 400 text messages in December. It recently delivered thousands more. But the Justice Department also said that it cannot find texts that Strzok and Page sent between Dec. 14, 2016, and approximately May 17, 2017. It blamed a technical glitch. The department said in a letter to Nunes that the FBI upgraded its phones to Samsung 7s at the time and that the phones "did not capture or store text messages due to misconfiguration issues related to rollouts, provisioning, and software upgrades that conflicted with the FBI's collection capabilities." The FBI's failure to retain the messages over that critical period — during part of the presidential transition up to Mueller's appointment — has added fuel to the political fire and allegations of a "deep state" cover-up at the FBI. Republicans have vowed to get to the bottom of the missing texts. Trump, meanwhile, took to Twitter to call the missing texts "one of the biggest stories in a long time." "The FBI now says it is missing five months worth of lovers Strzok-Page texts," he wrote, "perhaps 50,000, and all in prime time. Wow!"